The Town of Banff, Alberta, is located in the southwestern corner of Banff National Park, in the heart of the Canadian Rockies, about 90 minutes west from Calgary via the Trans Canada Highway. The largest community within Banff National Park, the Town of Banff is a unique destination that takes pride in accommodating visitors and providing tourism services, without losing the charm of a small mountain community. 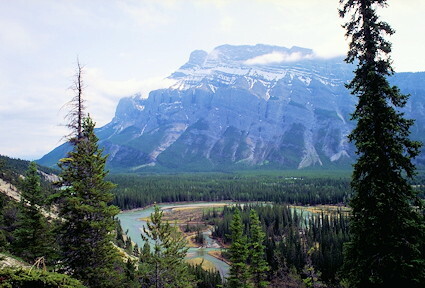 The Town of Banff sits at an elevation of 1,383 metres (4,537 feet) making it the highest town in Canada. Banff townsite is a hustling, bustling place year long with tourists from all corners of the globe. It serves as an Information Centre for Banff National Park and features a full range of services and recreational facilities. Both the town and park date back to the-mid 1880’s and owe their existence to the hot springs and the building of the CP Railway. Throughout the years, the town has experienced many changes and has expanded to meet the needs of the tourist trade. Shopping centres, groceries, souvenirs, hotels, motels, lodges, restaurants, fast-food outlets, recreational equipment and sporting goods, cinemas, museums, bus tours and tourist information . . . the town of Banff has it. The town of Banff, at the base of Tunnel and Sulphur Mountains by the Bow River in the Bow Valley could not ask for a more beautiful setting. Dominating over the town, the people and the activities are Cascade Mountain and Mount Rundle making a spectacular backdrop. Within the town limits are many attractions and numerous things to do. Visit the Cascade Gardens, the Banff Park Museum, and the Bow Falls, just to mention a few.